Sathya is a choreographer who likes to keep it dynamic always. His choreography is a beautiful amalgamation of movements created by him and the dancers. He starts off the process of creating a pattern which looks very simple in terms of a body movement. But what makes it challenging is the texture that he demands out of it and the most cardinal point is the co-ordination of different parts of the body that ought to work, just for 1 count. Adding to it would be a rhythm pattern that is completely disparate. Summing up, learning a bar of eight would be quite a task. This is why his sessions are astounding – keeps you alert, attentive and vigilant. Distraction of the mind even for a moment in his session would mean a call for tougher task of learning the rattling pattern. He likes to stimulate the dancer’s brain making the session a truly gratifying one. Sathya shows off his neck! “Less is more” is his belief! Presenting a simple movement in the most beautiful way is what he is proficient at! The subtle detailing enhances the movement. The weaving of such intricate movements into visually delightful pattern gives me a riveting experience. 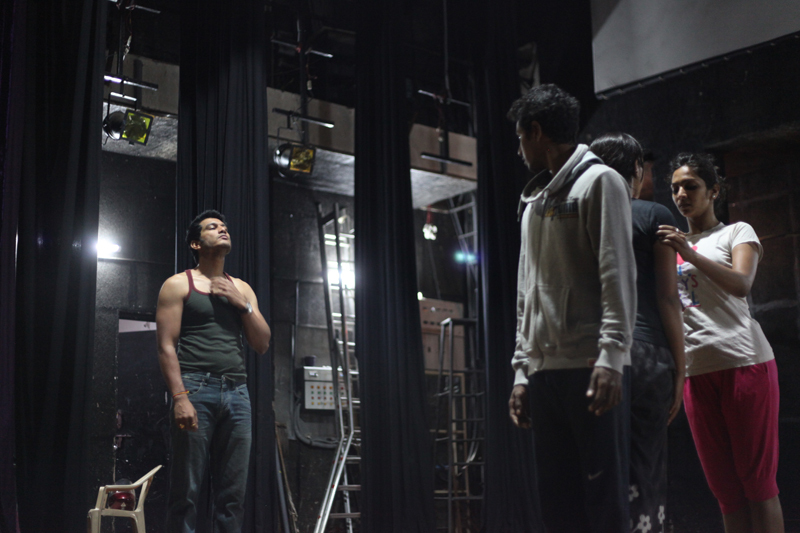 The time just fleets in his sessions as you get engrossed in the thought-provoking choreography process. “CIRCLE” is the basis of the choreography with a glimpse of the concept of “KARMA -What goes around comes around”. Expression through body, “Anga Bhava”, is the key factor to establish this. The piece is very vibrant another target to achieve is, to create rhythm patterns through these properties. Achieving the right rhythm and making these properties an integral part of the movement takes the piece a notch higher in the difficulty bar, making the piece more interesting though. I enjoy the journey of giving these properties the texture and “Bhava” that I give my body. There were workshops conducted on how to practice and create variety of rhythm patterns, by a renowned Mrudangist, Ranjini which helped us a lot. This aided us in working on the rhythm bits as a team by understanding the pace on a common ground. The Cubbon park sessions where we came up with unique patterns of rhythm using Natuvangam, Tamate and Bharatanatyam bols(solkattu) was enthralling and fun. Being a classical dancer I thoroughly enjoy the usage of different combinations “Adavus”, “Mudras” and bols that are used in this piece. Also, I was unexposed to a lot of stunts like rolls, back flips and lifts coming from a contrasting background. Have been quite surprised as to how I have been able to adapt and learn the different stunts involved in the piece. It has been great learning curve!! !